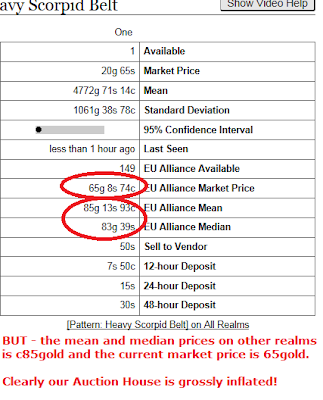 marketsforgold: The Flipping Market – watch the cross realm prices! The Flipping Market – watch the cross realm prices! i have had loads of emails on the Flipping Market following my prior post with some asking what the common traps are. 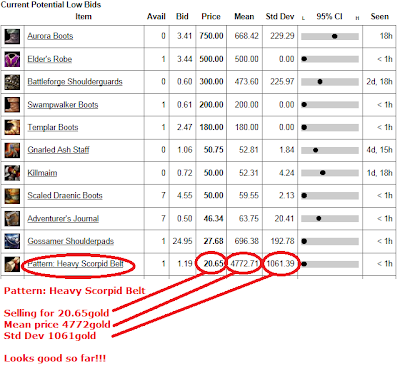 A recent scan using the Undermine Journal showed a potential great deal to buy a “Pattern: Heavy Scorpid Belt” for 20.65gold when the mean price is 4772gold and one standard deviation is 1061gold. Hence, the current price is strongly below the mean less 2 standard deviations. 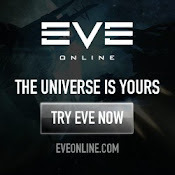 Indeed, a look at its recent posting history suggests that it is not often on the market and one has been on for 5000gold recently. So far so good. But the next steps of my research shows a problem and emphasises why these steps are important. 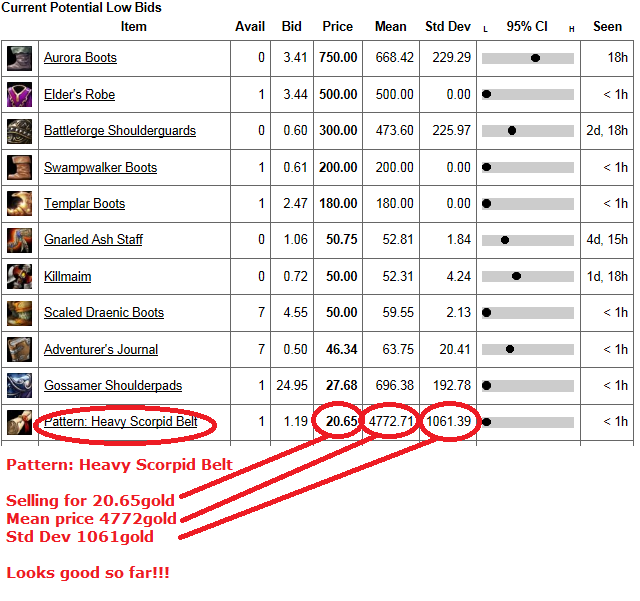 On other realms the Pattern sells for a mere 85gold! Therefore, it appears that we are seeing an inflated price here, caused by someone posting the Pattern for a very high price over a few days. 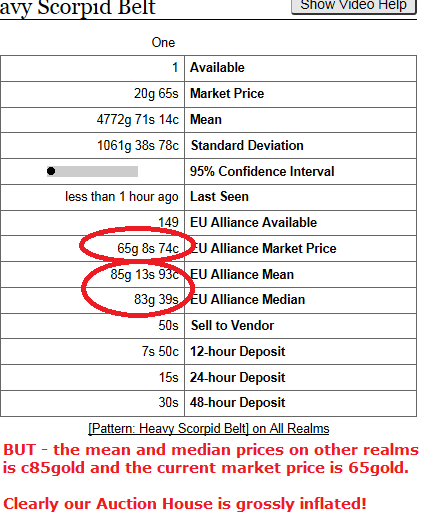 It is unlikely that my realm will have seen the prices jump to these new levels whilst the other realms have not followed. Hence, the mean price stated of 4772gold is unlikely to be a true and fair reflection of the price i would achieve and indeed a price of the mean price less one standard deviation is still very unlikely to be achived. Hence, i did not buy this Pattern. This is why when I use the TUJ addon in game to price my items for flip I tend to be very mindful of the global pricing as much as the realm pricing. I find especially when people are searching for a specialty item I might have on offer, they will also be looking at the same TUJ data I am more often than not to see whether the price is 'fair' or they're being gouged. Naturally, it's all a subjective view of things, but in the mindset of many, an 'average' standard across so many examples (all realms) will provide a better representation I think than specific, unusual and secular realm markets. Very good idea, usually I check wowhead to look at drop rates to determine what I'd be willing to pay for it, but this is a great tool for determining the value!